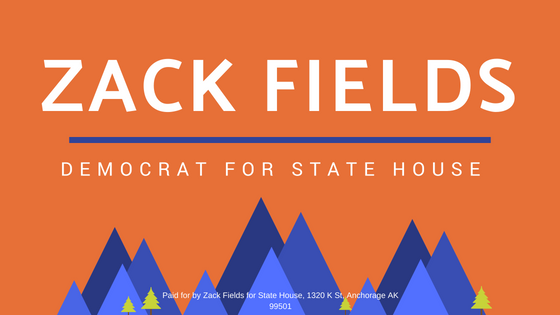 ANCHORAGE: Zack Fields has filed to run in the Democratic primary to represent House District 20, which includes the Anchorage neighborhoods of Downtown, South Addition, Fairview, Government Hill, and Eastridge. Early supporters of Fields’ candidacy include Mark Begich, Vic Fischer, Les Gara*, Vince Beltrami, Leslie Ridle, Heidi Drygas, Joelle Hall, Joey Merrick and Laborers Local 341, Jane Angvik, Kay Brown, Bill Wielechowski, Hollis French, and Kevin McGee. Zack Fields currently works for Laborers Local 341. He previously worked as Special Assistant and Workforce Development Coordinator for Alaska Labor Commissioner Heidi Drygas, where he focused on expansion of apprenticeship programs and enforcement of labor laws, including through partnerships with community organizations and local government. From 2012-2014, Fields worked as Communications Director of the Alaska Democratic Party in support of local, state, and federal candidates. He also has written outdoor articles for the Anchorage Press since 2013. From 2006-2012 he worked as a legislative aide at the local and congressional levels. He graduated from the University of Virginia with a degree in economics in 2006. Fields and his partner, Khalial Withen, live in South Addition with their six month old daughter, Zara. *I appreciate that Les Gara has endorsed me but he has said that he will endorse all candidates who he feels “will strongly represent the district and state.” As of this writing, he has not co-endorsed any other candidates. If he did decide to run again, I would withdraw. I see you are interested in increasing funds for the education system and the APDP. You are a proponent of an income tax, possible sales tax and you're open to raising taxes on oil companies. As an economics graduate, please tell us how much revenue you will generate with your new taxes, and the negative impact on those union people who work by the hour and the impact on poor people when the oil companies raise the price of a gallon of gas to cover your proposed additional oil tax. Respectfully, Tired of being over taxed.